When I was young, I spent most of my summers playing outside. I don't remember it being as hot as it is now in my hometown. If it was, we didn't notice. If we came inside, we were run back outside if we were too rowdy. Sometimes we stayed inside and watched game shows or cartoons if it was Saturday. I played Barbie dolls with my friend from across the street, sometimes by the hour. We drank out of the water hose or spigot if we were thirsty. We ran in the sprinklers and played in our kiddie pool or sat in wash tubs filled with water. When the neighbors across the street built a pool, we swam over at their house. We played hide-and-seek and chased each other around. We built forts in the woods near our house or in our backyard. We made mud pies. We rode our bikes everywhere and skated in the street or in our driveways. We chased fireflies in the evening and collected them in glass jars with holes punched in the lids. We antagonized roly polies just to watch them curl up, and we watched the activities of ants. I remember hearing, "Close the back door! Are you trying to cool the whole neighborhood?" And, "You're letting flies in!" "Go outside and play!" "Read a book." My parents took us on a two week vacation during the summer. I remember mostly going to Fernandina or Daytona beach in Florida. One summer, we drove to Washington, D.C. That was mighty brave of my parents considering there are five of us kids, and at the time, ranged in age from three to 12. Here I am with my brother. I don't know where or when this was taken. Probably "at a lake south of town" and in the late 1950s. After my parents built their lake house on Long Pond in south Lowndes County, we started going there for vacation. I think the longest we'd stay was a week. We'd usually only go for a weekend. 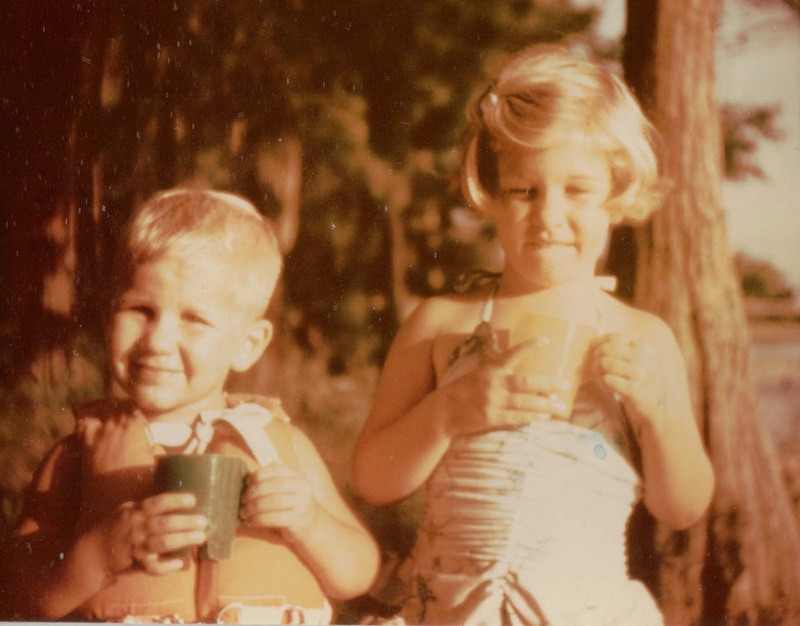 I'm not sure how much of a vacation it was for my parents who had to tote food, bedding, towels, and anything else we might need down there each time and contend with the sand and lake water we brought inside the house with us. The only air conditioner in the lake house was a window unit that had been inserted in the wall of the living room, so we used fans in the bedrooms. I'd go to sleep listening to the sound of the fan. It was relaxing. To this day, the drone of an oscillating fan makes me want to take a nap! This sounds a lot like my summers and it made me smile to remember. But you forgot one thing...the feel of a squishing a slug between your toes when running around barefoot at dusk. Ewww! Ewww! I totally forgot! That gave me the shivers! We went barefoot all the time, too.